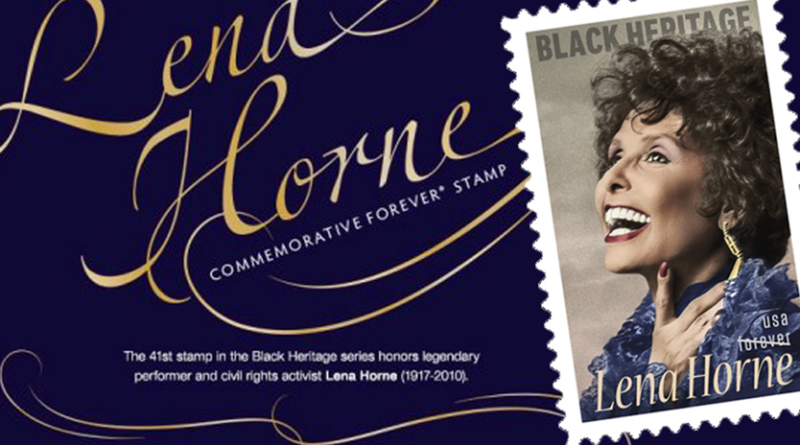 Singer, entertainer, civil rights activist Lena Horne has been honored by the issuance of a Forever U.S. postage stamp in the Black Heritage series. It was released in New York City on January 30, 2018. Born June 30, 1917, in Brooklyn, N.Y., Horne was largely raised by a grandmother, Cora Calhoun Horne, who had been a college-educated suffragette. She gave the two-year-old Lena a lifetime membership in the National Association for the Advancement of Colored People (NAACP). Her performing career began in the mid-1930s with a small part in a Broadway play. Then she toured as a vocalist with Noble Sissle and his orchestra, with whom she made her first recordings in 1936. Later, touring with Charlie Barnet’s band, she faced open racism from audiences, hotels and managers, and quit. Horne was a staple at the Café Society in New York City, an integrated performance venue receptive to left ideas. 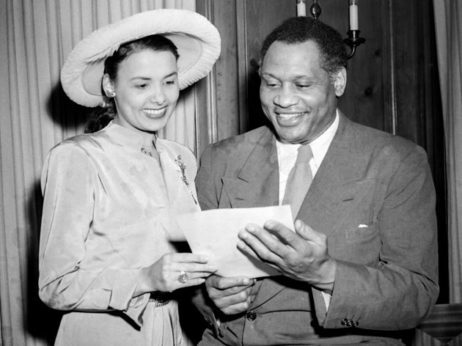 In those circles in the early 1940s she was introduced to Paul Robeson, W.E.B. Du Bois, and the scholars, writers and activists involved with the Council for African Affairs. Horne moved to Hollywood in 1941 and signed with MGM—the first Black actress to sign a long-term contract with a film studio since 1915. But she refused to portray stereotyped black characters. Nor would she impersonate a Latina. At that time, Hollywood would not promote Black and white actors equally in pictures, and after just a few films, including her breakout role in Stormy Weather (which became her signature tune), Horne had no more significant acting roles with MGM. The studio did use her for incidental vocal roles (such as an entertainer at a night club), sidelined in otherwise all-white features, but her scenes would routinely be cut from the film for screenings in the South. During World War II, Horne toured with the United Service Organization (USO), entertaining at armed services camps around the country. An incident at a camp in 1944, where African-American soldiers were seated behind German POWs, caused Horne to end her formal connection with the USO and to entertain exclusively at camps for Black servicemen. Finally those soldiers had a “pin-up” celebrity to call their own. After the war, Horne worked on behalf of Japanese Americans who were facing discriminatory housing policies, and she joined with Eleanor Roosevelt to press for anti-lynching legislation, which was one of Robeson’s principal campaigns. 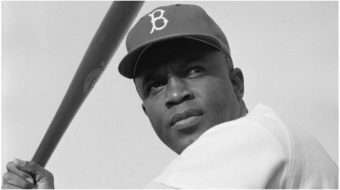 In the late 1940s Horne sued a number of restaurants and theaters for racial discrimination. 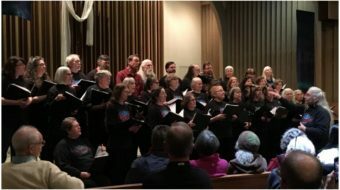 Among the several organizations that claimed her attention were the Joint Anti-Fascist Refugee Committee and Citizens Committee of the Arts, Sciences and Professions, both strongly under the sway of the Communist Party. In 1946 she accepted a New Masses magazine award. Listed in the Red Channels pamphlet, Horne suddenly found she could no longer get work. It took an agonizing series of interviews and letters to Red Channels, personal pleas to TV variety host Ed Sullivan, and a lengthy missive to Roy Brewer, described as “the toughest anti-communist in Hollywood,” to eventually clear her name. Copies of her letters regularly got forwarded to FBI Director J. Edgar Hoover. In a ritual that many performers felt obliged to participate in, she was forced to admit that her passion for democratic rights had been thwarted by communist influences to which she was naive. By mid-1953 Horne was back in the limelight. Horne’s one-woman show on Broadway, Lena Horne: The Lady and Her Music, opened in 1981 and ran through 1982. She received a special Tony Award for her performance, as well as a Drama Desk Award and a special citation from the New York Drama Critics’ Circle. The blacklist over for good, in 1985 Actors Equity presented her with the Paul Robeson Award (he had died in 1976), which she accepted without hesitation, and praised him for helping her to understand herself and her place in America. She died in 2010. Remembered as one of America’s great interpreters of popular songs, Lena Horne was also a trailblazer ion Hollywood for women of color. She used her personal elegance, charisma and fame to become a notable spokesperson for civil and democratic rights. 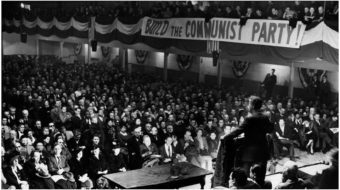 Sources: United States Postal Service; John Merone,“The Red-Baiting of Lena Horne,” in the Atlantic magazine; John Andrews obituary of Horne on the World Socialist Web Site.